Convert any video to GIF, including AVI to GIF. Convert videos between 1,000+ video and audio formats including MP4/AVI/MKV/MOV/MKV. AVI is a multimedia container format that can store video as well as audio content. The AVI files are large in size and difficult to send or upload them over the internet for conveying or other purposes. So to use your AVI videos for animations and information, converting AVI to GIF is the best solution. There are a number of AVI to GIF converters as discussed in the following part of the topic. The best and the most professional tool to deal with all your queries on videos is Wondershare UniConverter (originally Wondershare Video Converter Ultimate). The software works as an excellent AVI to GIF converter for Windows as well as Mac system and results in high quality animated images. Additionally, UniConverter supports video conversion between 1000 format, video download from over 10,000 sites, video transfer, DVD burning, and video editing. Convert AVI to GIF in a few simple steps. Supports an array of other formats for GIF conversion as well. Allows trimming, crop, and editing the video files before converting to GIF. High-quality GIF images are created. Allows selecting frame rate and size of the GIF animation. Step 1 Launch Wondershare AVI to GIF converter and choose to create GIF. Download, install, and open Wondershare UniConverter on your PC/Mac (Mojave included). From the main interface, choose the Toolbox tab and then select the GIF Maker option. Step 2 Load AVI file and choose settings. From the GIF Maker window, click +Add Files to import AVI files from your PC. From the right side of the window, choose the start and the stop time of the video for which you wish to create a GIF animation. Next, choose the Output size and the frame rate of the animation. At Save to: tab choose the location on your PC where you want to save the converted animation. Step 3 Convert AVI to GIF. Finally, click Convert to start the process to convert AVI to GIF. VLC needs no introduction when it comes to a multimedia player. This cross-platform, free to use, and portable player also supports an array of functions besides playing videos in a variety of formats. 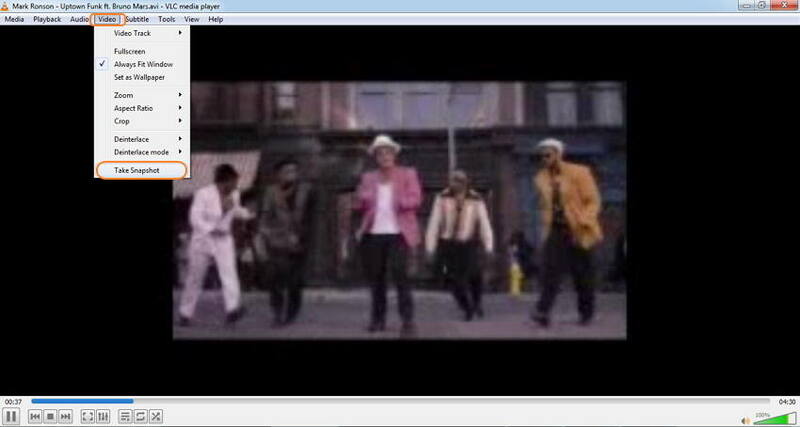 VLC works as a decent GIF converter as its snapshot function allows saving the desired video frame as an image file. Using the player’s feature, you can also change the speed of the video or also move to a specific video time to capture that particular frame. Step 1: Launch VLC Media player on your PC. Click Media > Open File to browse and load AVI file from your PC. Step 2: The video will start playing on your VLC. 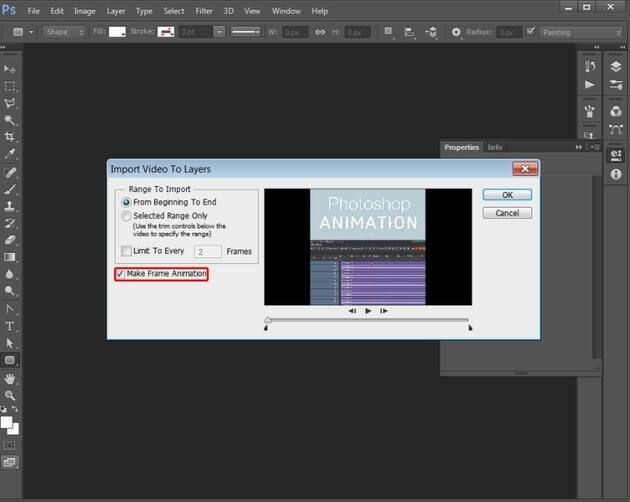 Choose the video frame which you want to save as an animation, and from the Video menu, select Take Snapshot. The video frame will save as PNG file in My Pictures folder. 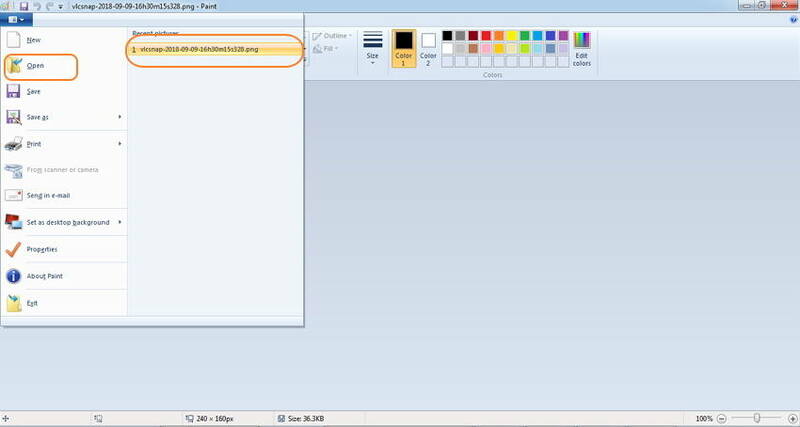 Step 3: Next, open MSPaint app on your PC and from the File menu, open the snapshot picture from My Pictures folder. Click on File, and then Save As and select GIF as the new file type at the desired location on your PC. Created by Adobe, Photoshop is graphic design software that facilitates image creation and photo editing. You can create an animated GIF using the AVI to GIF converter on your Windows or Mac system. The layer-based editing system is used by the software for image creation as well as editing along with multiple overlays with transparency. Step 1: Launch the Photoshop app on your PC. Click File > Import> Video Frames to Layers and load the AVI video from your system. 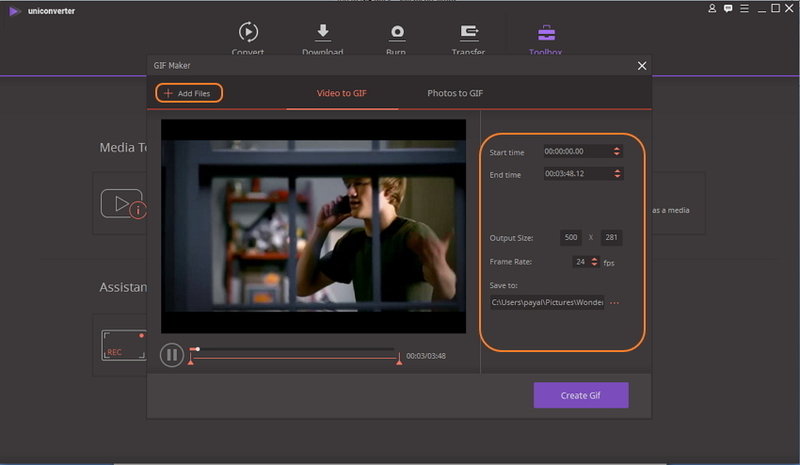 Step 2: To choose the part of the video for which you wish to create a GIF, choose from the Range to Import- from Beginning to End or Selected Range. Check the box at the Make Frame Animation option. Step 3: Next, move to Window and check the Animation. If you need, you can trim or add the frames as required. Move to the left side of the animation frames and check Forever. Step 4: After that, go to File > Save for Web. From the Preset menu, choose one of the GIF options. Alternatively, you can also select the GIF option from the drop down list under the present and then adjust the options as required. Finally, click Save and give a desired name to the file. 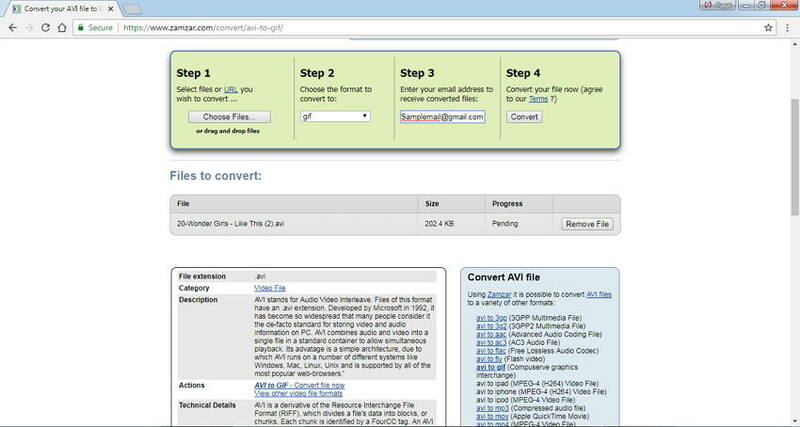 There are a number of AVI to GIF converter online tools available that are fast and simple to use. The online programs work directly from your browser and thus need no download or installation. Listed below are top 5 AVI to GIF online converters. This is a popular online GIF generator that allows adding AVI as well as other file formats for quality conversion. 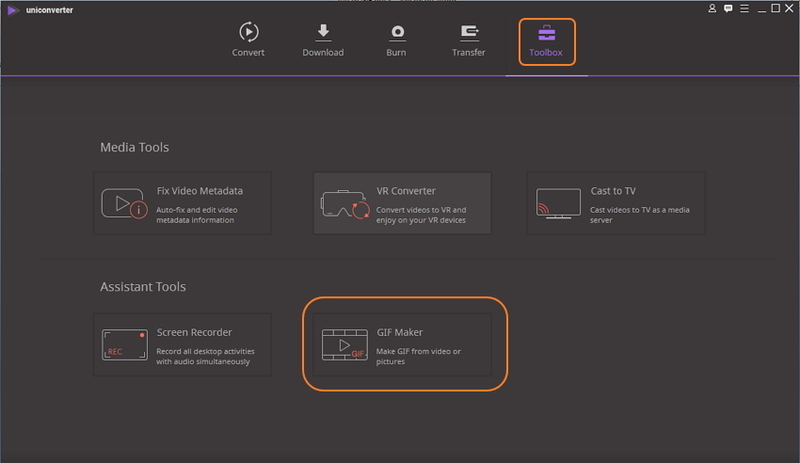 The AVI to GIF converter free allows you to cut the video and also set the frame rate as required. The process is fast and the interface is simple to use. Step 1: Enter the site on your browser. Click Choose File to upload AVI video. Step 2: Under the Options category, cut the video if needed and select the desired frame rate. Step 3: Click Convert to proceed with the process. Allows adding local files or its URL for conversion. Video can be cut if needed. Allows choosing the frame rate. 200MB is the maximum file size supported. 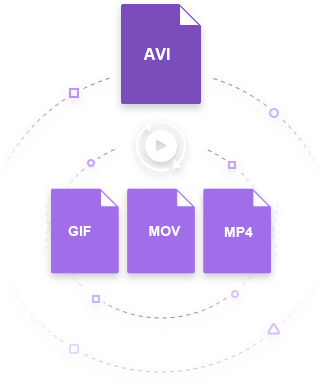 This widely used AVI to GIF online converter supports MP4, WebM, MOV, AVI, and a range of other video formats for converting it to GIF animation. You can choose the frame rate as well as the size of the output file and also select the video portion for which you wish to create GIF. Step 2: A new window will open showing the size of the file and other parameters. From here, choose the start and the end time of the video for creating GIF. Also select size, frame rate, and method. Step 3: Click Convert to GIF! to start the conversion process. Option for optimizing video for static background. Allows selecting frame rate and size of the video. Files can be fetched from the computer, Smartphone or online sources through URL. A maximum 120MB file can be uploaded for the conversion. The limited format supports as compared to other programs. The conversion speed is dependent on your internet connectivity. ZamZar needs no introduction when it comes to online video conversion tools. This expert program allows converting AVI and other popular formats to GIF animation in a few simple steps. The converted animation is sent to mail for download. Step 1: From your browser, open https://www.zamzar.com/. Click Choose Files to import AVI files from your PC. You can also drag and drop the files. Step 2: At the Convert to: tab, choose GIF as the target from the supported image formats list. Step 3: Enter Email address where you want to save the converted file. 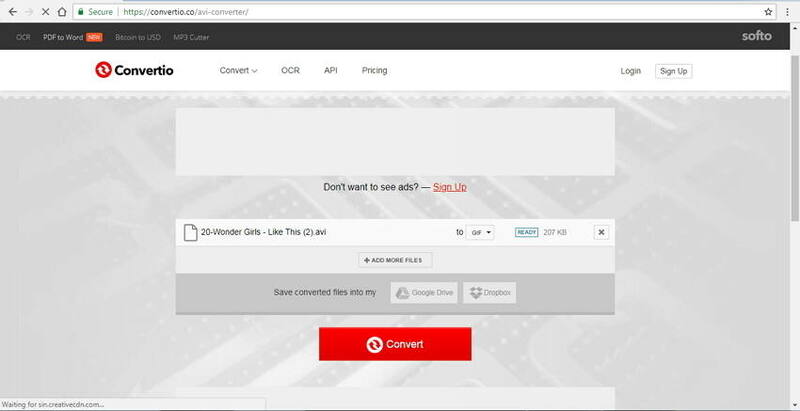 Step 4: Click Convert to start uploading a file and converting it to GIF. Need no download or installation. The converted file is sent to mail id and cannot be directly downloaded from the interface. No option to choose frame rate or other file parameters. This free GIF maker supports over 200 formats including AVI for conversion to GIF animation. The program has a simple interface and allows quick conversion. You can add local AVI files or videos from cloud storage and URL as well. Step 1: From your browser launch https://convertio.co/avi-gif/. Load AVI file from the computer, URL, or cloud storage. 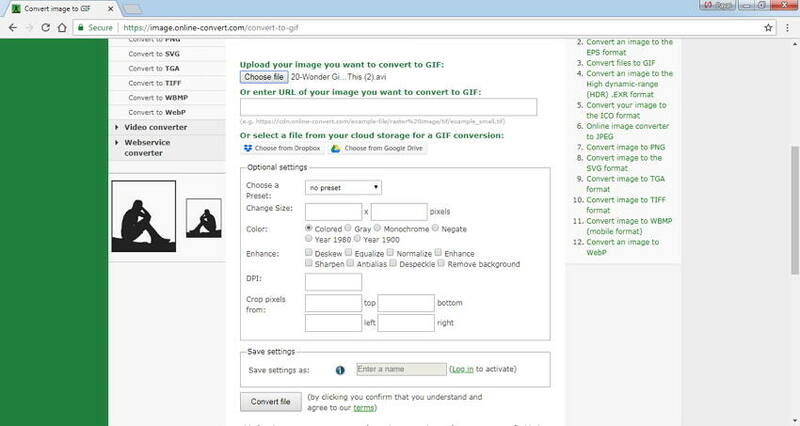 Step 2: Choose GIF as the target format and if required, choose to save the converted file to Google Drive or Dropbox. Step 3: Click the Convert button to start the process. Facilitates adding files from computer, URL, Google Drive, and Dropbox. Supports over 200 formats for conversion. The converted file can be downloaded or can be directly saved at cloud storage. 100MB is the maximum file size for video upload. Dependent on availability and speed of internet connection. No option for choosing frame rate, size, and other file parameters. 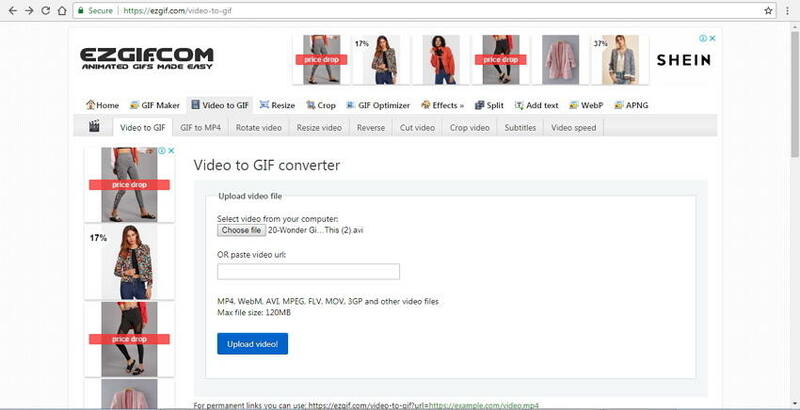 This AVI to GIF converter online tool supports converting your AVI and other videos in high-quality GIF animations. The program supports selecting a preset, changing the size, editing the colors and other parameters. AVI files from computer, URL, and cloud storage can be added for the process. 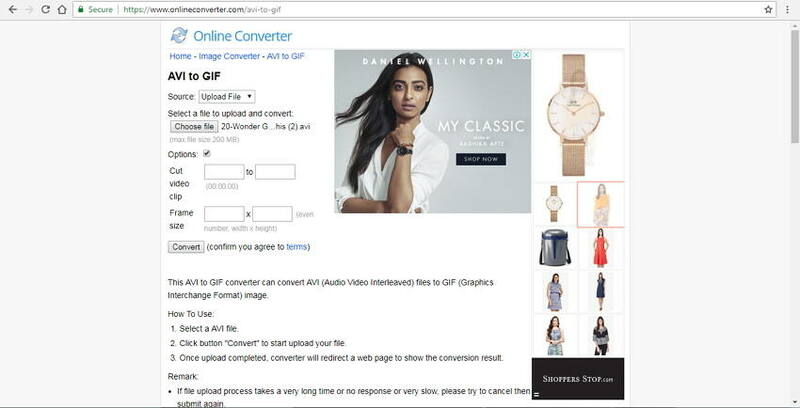 Step 1: From your browser, launch https://image.online-convert.com/convert-to-GIF. Click the Choose File button to add AVI files. 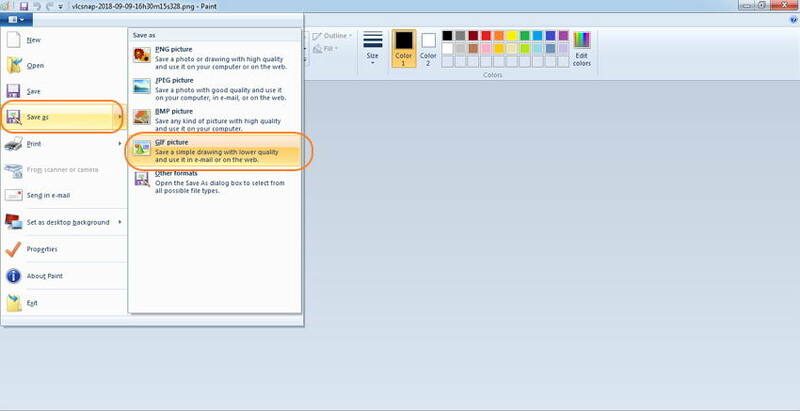 Step 2: Under Optional settings, choose the size, color, and other mentioned parameters. Step 3: Click the Start conversion button to start converting AVI to GIF. Add AVI files from computer, URL, Google Drive, or Dropbox. Allows enhancing the animation with multiple options. The conversion settings can be saved for future files. The speed of conversion depends on network speed in your area. In summary, if you want to own a professional all-in-one AVI to GIF converter, video downloader and video editor, DVD burner, we suggest you to download Wondershare UniConverter to have a free trial.